Bettina Aller is one of the first scandinavian woman to have reached the North Pole on skis. Being the mother of two children and running an international publishing firm, she made her first expeditions in the jungle, before turning to polar regions. 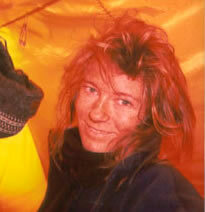 2006 : The Arctic crossing expedition 2006, with Jean-Gabriel Leynaud, she tried to cross the Arctic Ocean on skies with everything we need after her in the pulkas (sledges.). About 2000 km. Of snow, ice and ocean will be our home for the coming 100 days. 2004 : North Pole Expedition with french cameraman Jean-Gabriel Leynaud - supported.North Pole attempt, starting from Arktichewski Cape. Start : March 5th. Resupply : April 18th. Arriving at the Pole : Day 58 of the expedition on May 1st. Many difficulties on the way : bad weather and negative (southerly) drift. 2001 : Arctic Traverse ExpeditionSecond attempt for the great traverse Arktichewski - Ward Hunt alone. Start : March 2nd. Abandon : day 7 on March 8th at 81° 652 N / 96° 264 O. Pick up by helicopter MI8 on March 9th. Cause : followed constantly by polars bears, she had to keep her gun unpacked ready to shoot. Unable then to wear proper gloves, she got frostbite at two fingers on her right hand. Unable to proceed. 2000 : Arctic Traverse ExpeditionAttempt of the great traverse Arktichewski - Ward Hunt alone. Start : February 27th. Abandon : March 8th (day 10 of the expedition) at 81° 48' N / 93°30'O. Distance covered : 79.12 km. Cause : severe knee injury.